Bangladesh has banned publications by the minority Ahmadiyya movement amid demands from Islamic hardliners that it be declared non-Muslim. The Religious Affairs Ministry took the decision late on Thursday, with the ban beginning on Friday. 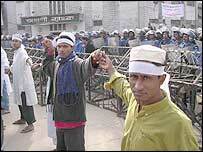 A 5,000-strong rally marched to an Ahmadiyya mosque in the capital Dhaka on Friday to denounce the movement. The Ahmadiyyas, who number 100,000 in Bangladesh, do not believe Mohammed was necessarily the last prophet. The government said it was banning the publication, sale, distribution and preservation of all books and booklets on Islam published by the Ahmadiyya in Bangladesh. A home ministry statement said the ban "was imposed in view of objectionable materials in such publications that hurt or might hurt the sentiments of the majority Muslim population of Bangladesh". 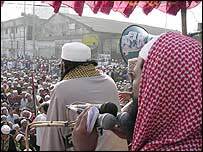 Hardliners had threatened to start dismantling Ahmadiyya mosques if action were not taken against the group by Friday. The BBC's Waliur Rahman in Dhaka says the ban is believed by many to be the first step towards declaring the 100,000 Ahmadiyyas - also known as Kadiyanis - non-Muslim. That has been the demand of the mainstream Hifazate Khatme Nabuwat Andolon. Its spokesman, Mahmud ul-Hasan Mamtazi, said: "We welcome the government decision... but it is still short of our main demand and we'll continue our movement until our demand is met." It issued a two-week deadline for the movement to be declared non-Muslim and said it would carry out more protests. The Ahmadiyya Muslim Jamaat Bangladesh said the decision had shocked the entire community. Spokesman Abul Awal said: "The government has bowed to religious terrorists. The people's right to freedom of expression as enshrined in the constitution has been violated by taking such a decision." About 500 security personnel were deployed to police Friday's rally in Dhaka. There had been threats that the Ahmadiyya mosque would be taken by force, but the rally passed off peacefully. It vows to revive Islam by stressing non-violence and tolerance. But it also believes there can be prophets after Mohammed, which mainstream Islam regards as blasphemous.